When a company like Spartan Blades teams up with a legend like Bill Harsey, the result can’t be anything less than stunning. 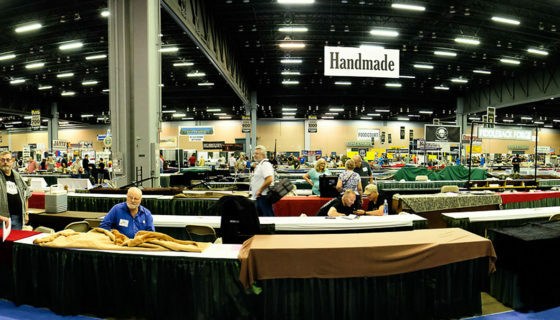 Their combined Tactical Trout project goes back as far as 2009 during Blade Show when Bill secretly showed me his new concept, a Trout fixed blade dedicated to outdoor use. Later on, during the design process, that Trout was “tacticalized” with a sturdy saber grind and a handle borrowed from the H-Class Tanto. (A full-size tactical knife also designed by Bill.) 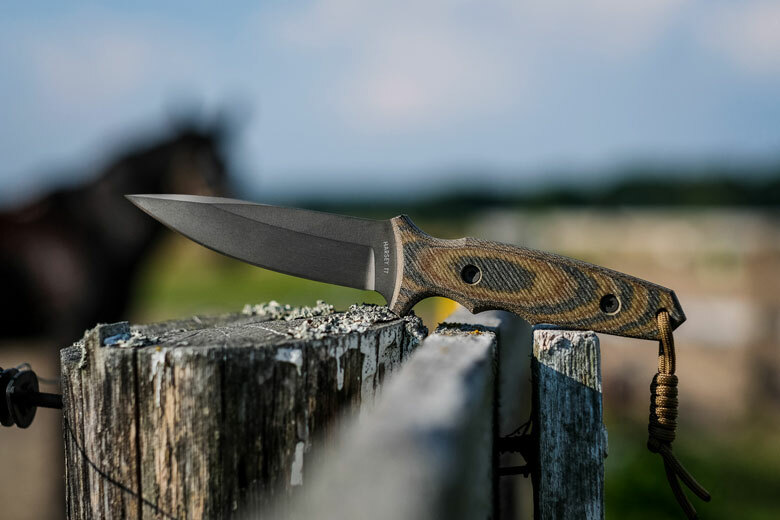 Back in 2009, Harsey’s Trout wasn’t yet intended for Spartan Blades, but now 9 years later, the Trout and H-Class Tanto designs have been merged into one knife by Harsey and produced by Spartan. 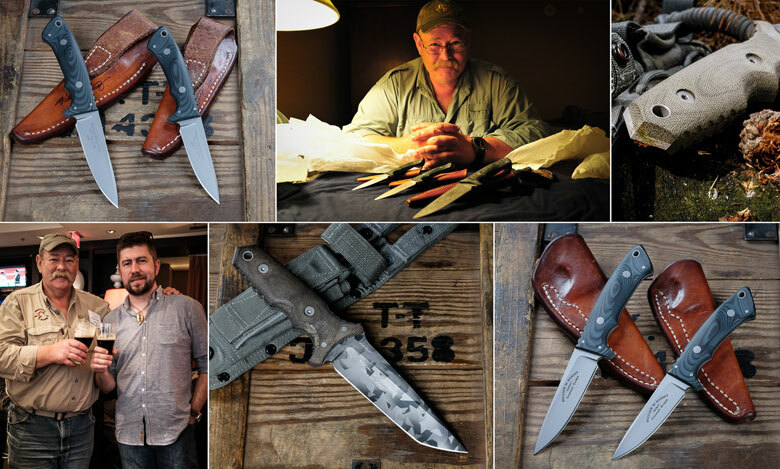 Now you know why the name couldn’t be more accurate, it’s a tacticalized Trout knife, hence the Harsey Tactical Trout. 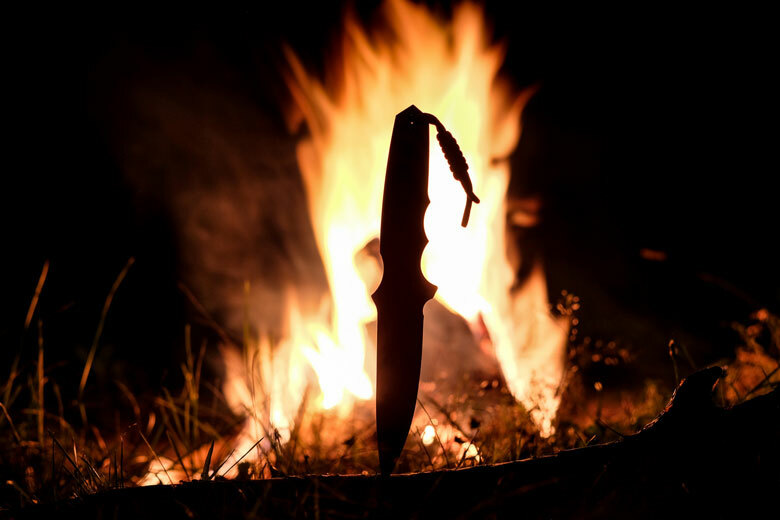 In an outdoor adventure, survival or tactical scenario, a fixed blade is typically preferred. It won’t break as easily as a similarly sized folder, no matter how strong the folder’s action is. There’s no pivot to work loose, no lock to fail and no mechanics to get stuck halfway. That’s exactly the philosophy behind the Harsey Tactical Trout; it’s a stout piece of everyday-sized steel sandwiched between two slabs of G10. It’s simply indestructible during normal use and you’d be hard-pressed to even destroy it under battlefield abuse. We knife junkies expect new exotic super steels in every fresh knife model on the market. However, Law Enforcement and Military users want a blade that’s both good to use and easy to maintain. (Think rustproof and possible to sharpen in the field.) The choice to include S35VN steel in the Tactical Trout is a damn good idea. It’s not the latest and greatest material, but it’s been proven in all conditions and environments as a great all-around blade material. 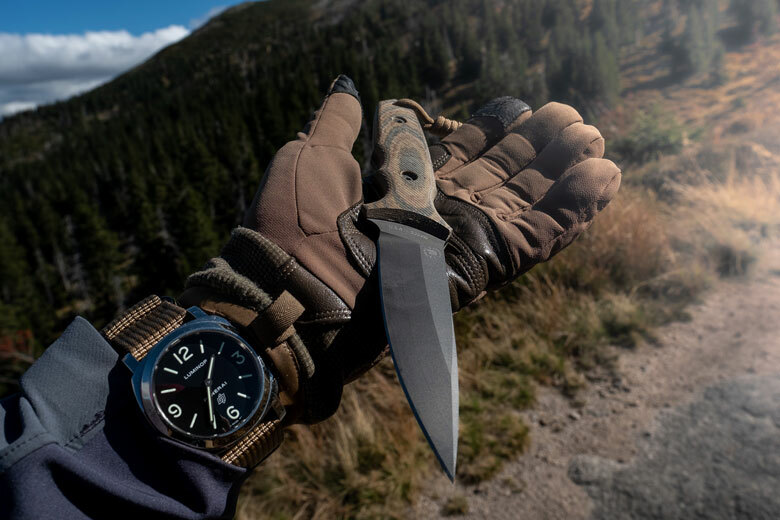 Developed by the steel company, Crucible Industries, with the consultancy of Chris Reeve himself (Blade Magazine Hall of Fame Member), S35VN steel has been widely used as a material for mil-spec knives and is in use by quiet professionals around the globe. In addition to its base toughness, Spartan Blades hardens it up to 60 HRC and adds a DLC coating to reduce wear and glare. Let me tell you, the coating itself is tough as nails too! I remember chopping through frozen (-15 Deg C) pine with my Spartan MOD.1 years ago, which features the same coating. After cleaning off the resin and dirt, it looked almost brand new; no joke. This was actually posted on the USN knife forum way back in 2011. 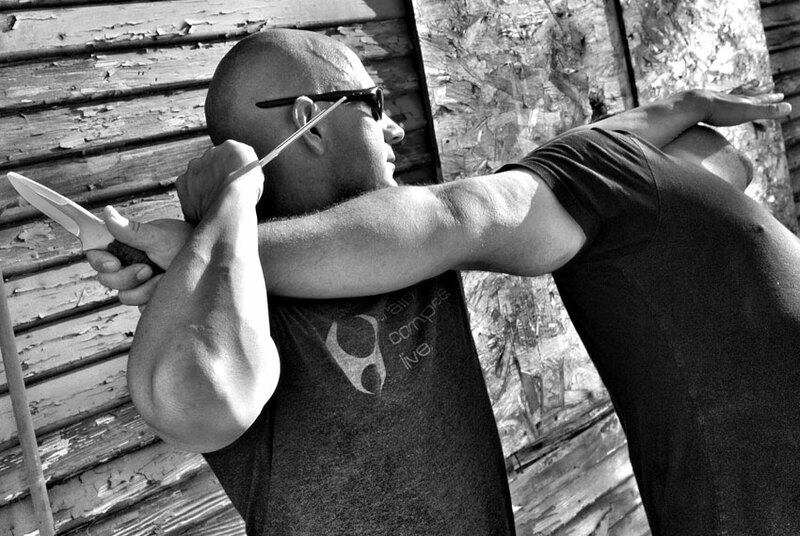 A knife’s handle is important, as it transfers the power of your muscles to the cutting edge. So not only should it be tough, (G10 slabs are damn tough) but it should also be comfortable in many grips. Bill Harsey, an outdoorsman, hunter and former lumberjack knows what to look for in a handle for built for comfortable long use and safety. There’s no extravagance, bells or whistles on this knife, just flowing natural curves. The handle ends with a bold “skull crusher,” but of course most of us probably won’t be crushing any skulls with it. However, it can also be used as an impact device to break a window or even to crush and open nuts or shells. 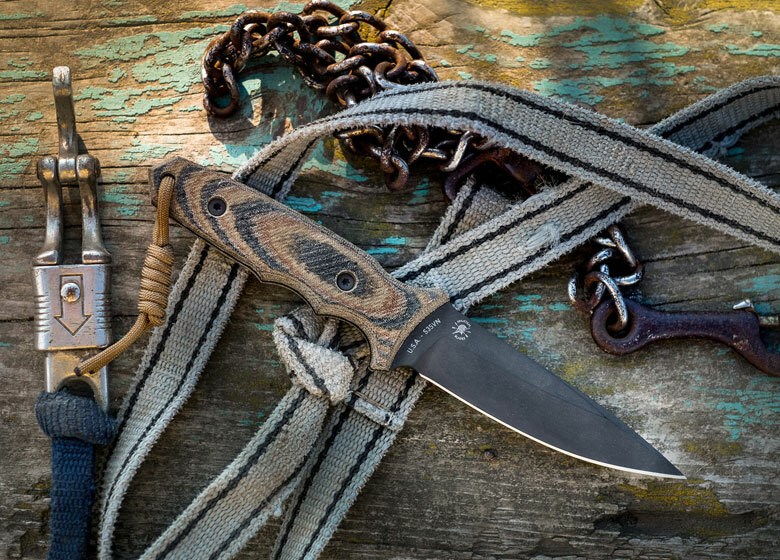 The Trout features a classic blade shape and a great EDC length of 4.5 inches. Combining that with the high saber grinds makes the Tactical Trout a multi-application knife. 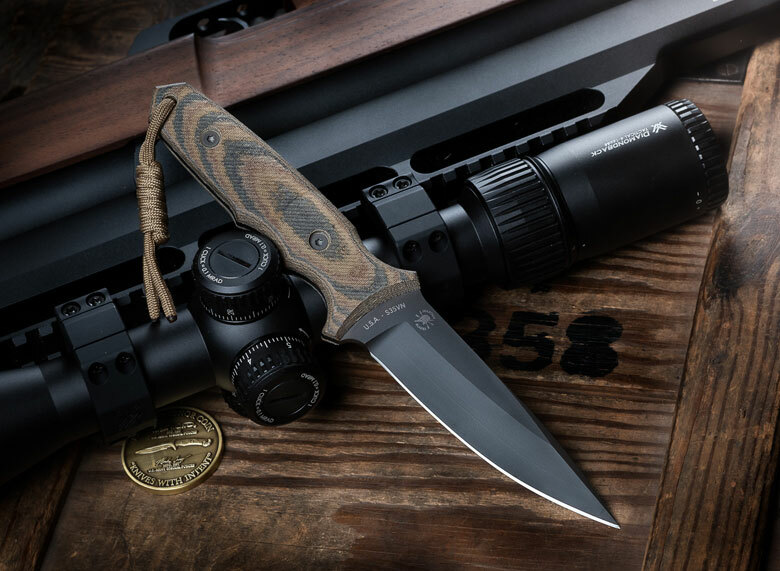 It’s meant more to be an all-around everyday companion than just a specialized tactical knife. 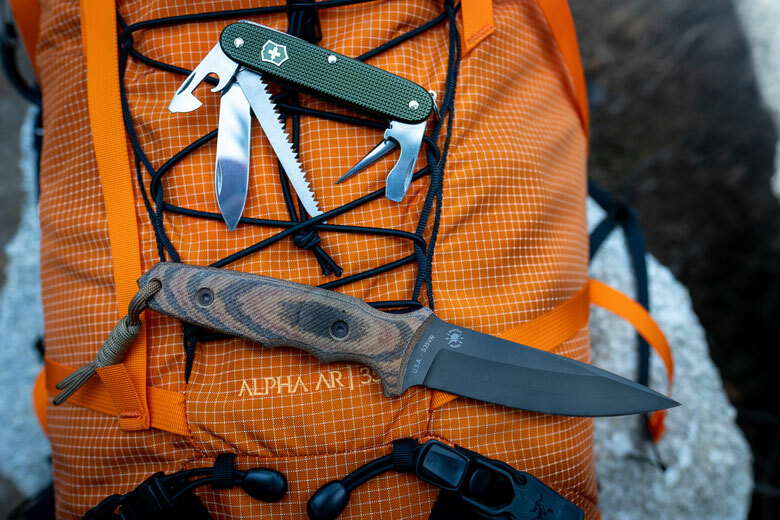 This sharp “tactical” instrument can also cut rope, split branches for firewood, or even clean a salmon freshly caught in the Cooper River on your Alaska trip. 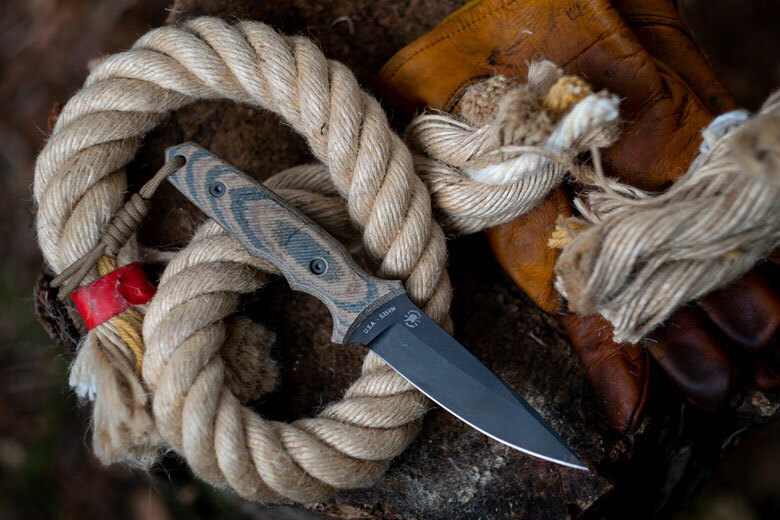 There’s no question the Trout is really sharp out of the box, but the cutting edge has a bit thicker base than what you’d find on a pure bushcraft-style knife. The edge is optimized to prevent chipping, even when used hard (think cutting through metal wire or other hard materials.) This is important, as this knife could end up on a duty belt. With a diamond sharpener and a bit of spare time, it wouldn’t be any problem to resharpen the actual edge to a bit steeper angle, which would make it a dedicated outdoor companion. Personally, I didn’t find that beneficial on my knife and I actually enjoyed the more forgiving edge for true everyday carry. As you can see, cutting through a 1-inch hemp rope is just a matter of adding some slicing action to the push cut. This sharp edge will definitely last a long time. I also tested the Trout on general whittling and the ability to do basic camp jobs. Making stuff like tarp stakes isn’t an issue at all. It does take a bit more time and requires a bit more force than a Scandi knife, (Scandanavian) but it’s not an issue. Of course, the reward on this knife is a much stronger edge than a Scandi. It’s a robust worker that can be adapted to more than one role. The tip of the Tactical Trout is dead-on pointy, enhanced by a false edge, that’s excellent for thrusting with scary penetration potential. 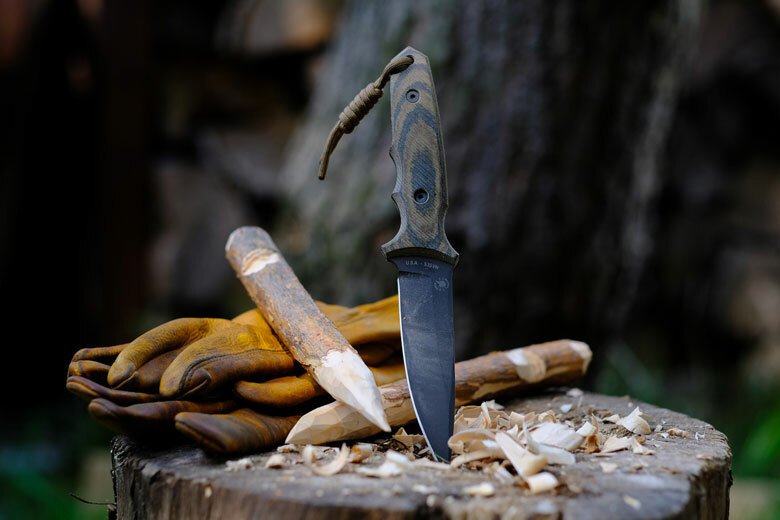 It can be also used for delicate and precise work, so it isn’t a “sharpened crowbar” type of knife, which is often the case with tactical knives. 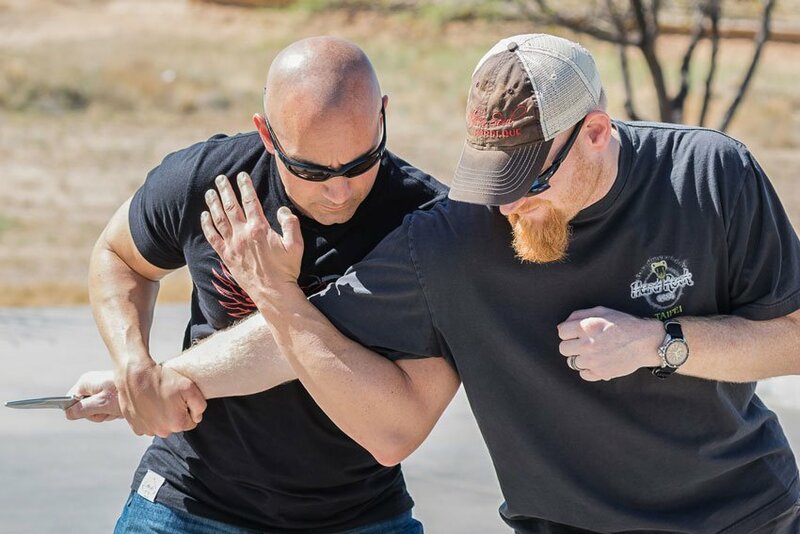 The Trout’s tip is a useful tool that can be also very effective for self-defense in a CQB situation. However, the geometry still makes it strong and you could even drive it through a car door if you really had to. I received my Trout with a nylon sheath and decided to make my own kydex sheath as a second carry option (a kydex sheath can be also purchased with the knife.) Now I have both a nylon sheath for backpack/MOLLE carry and kydex if I need more concealment. It all depends on what you need or prefer. The nylon sheath is US-made with a kydex liner and features PALS on the front for easy accessory attachment. I put the ITS TourniQuick® Pouch on mine and it fits great. The Tool of All Trades? So what exactly is the Spartan Harsey Tactical Trout? First and foremost it’s an EDC fixed blade with hard field use and defensive capabilities in mind. It’s a field or ranch knife that’s always ready for any job, no matter how tough. 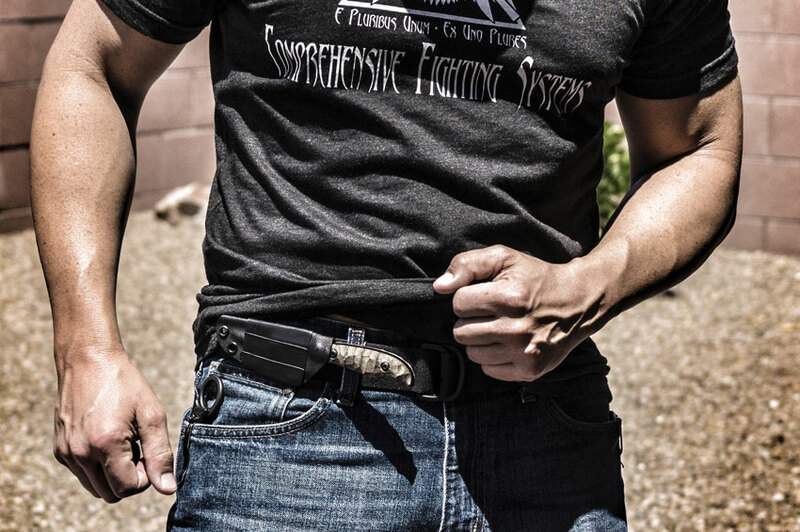 It’s a tactical knife that can be carried on a duty belt and after duty too. It’s also a personal fixed blade for a wide variety of scenarios in an urbanized arena, from pure utility to pure defense. If you’d like to use it just as an outdoor knife, then re-sharpening the cutting edge to an inclusive angle of about 35 degrees is something to consider. 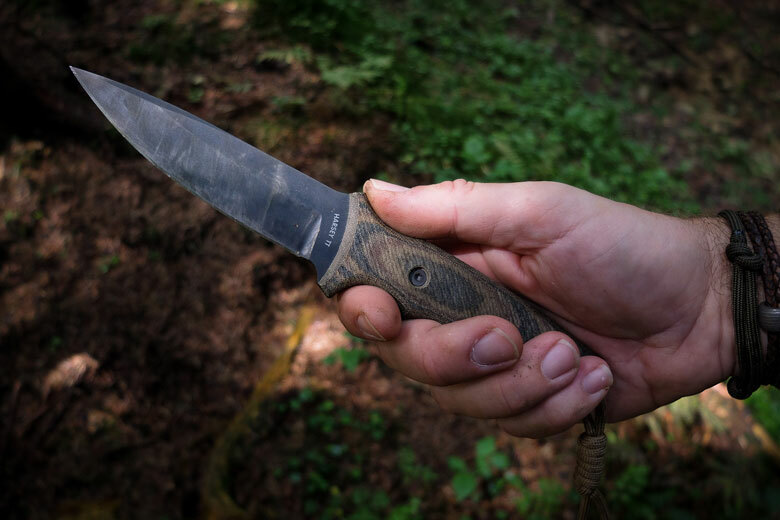 However, if you’d like to treat it as true EDC companion for good and bad times, or if you’re an active Military, SAR team member or Law Enforcement Officer, just put one on your belt and enjoy one of the most versatile fixed blades money can buy. The Trout isn’t too heavy for 24/7 carry, it’s not too big to conceal and it doesn’t hinder your movement while sitting or driving. So is it a jack of all trades? I would say yes and probably even more than that. It’s a bit like a Glock 22; compact and simple, yet well regarded, tough and effective. Let’s say less than 44 magnum, but more than a single stack 9mm. You can almost forget it’s there until you need a damn sharp, strong and pointy blade, then it’s there at your fingertips in a split second! To get the max out of the Trout in the field, I paired mine with the tiny Victorinox Farmer on my last mountaineering hike. That way, I could have a brutally sturdy blade that was instantly accessible and lightweight enough to backpack with, but also have a fine cutting tool with a saw and an awl. Even in the worst rainy conditions, I could cut branches (2-3 inch in diameter) with the Farmer, split them with the Trout to expose the dry wood inside and then use the sharp awl as a ferrocerium rod striker. After all, the ability to start a fire is one of the most important skills (if not the most) any outdoorsman should possess. In my personal opinion, the Tactical Trout is one of Bill’s best designs, or actually a blend of two. 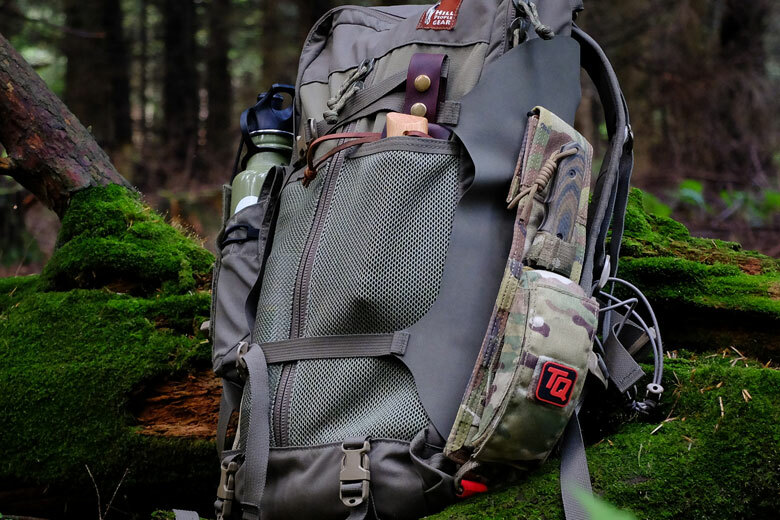 As you can guess though, the best stuff doesn’t come cheap and the Harsey Tactical Trout will set you back about $350. However, if you can afford it, considering the manufacturing excellence of Spartan Blades and design genius of Bill Harsey, it’s money well spent in my opinion. The last thing to cheap out on is a piece of equipment that could possibly save your life one day. This is an especially important point to consider for professional users. The Trout will serve you for a long time and it’s still way cheaper than your firearm, optics or body armor. However, ultimately it could be just as important one day, but that’s just my $0.02. Editor’s Note: Piotr Ma is an avid outdoorsman, adventurer, mountaineer and certified open sea sailor. As an enthusiast of quality gear, he’s always seeking the most un-compromised and best-performing gear available worldwide. He’s also known as an edged tools specialist. Piotr was introduced to his adventurous lifestyle when he was 10 by his father, a certified sailor and alpine-style climber. Now he continues his family tradition and shows his kids how to live a full life in the great outdoors; teaching them survival skills, shooting and archery. These days, he gladly shares his 30+ years of outdoor experience with people around the globe from his current location: Poland, European Union.